Cards are a great accessory to have around when you have kids. They are portable, easy-to-find, and cheap. And, after the kids are in bed, you can play gin rummy or poker with your spouse. For kids 2-3, you can just create a game yourself based on what interests your child. Let him or her group the cards by color, number or suit. Or, look for similar cards playing a simple version of “Memory” with just a few cards. 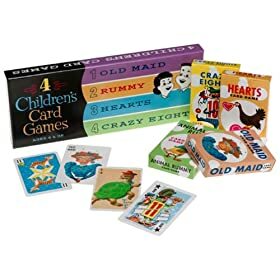 All kids love Old Maid, the politically incorrect classic that is easy to play once you take out all but one Queen. The game hasn’t changed since you were a child. Deal all the cards out, and take turn drawing from your neighbor until you find all the pairs. The player left holding the Queen is, well, the loser. Go Fish is an important cultural touchstone. How can anyone ever understand the many references to “go fish,” without playing this game where each player collects sets of four cards by asking another player for a specific numbered card. The player who collects the most sets wins. There’s also a good math principle in the works here. We love SNAP! Deal all the cards and and all the players flip a single card at the same time. Players yell out SNAP! if they see a pair. Winners take the card. There are lots of ideas for kids (and adult) card games, played with a simple pack you can find at the drugstore. More ideas can be found at usplayingcard.com.